Selecting a front door for your home is an important process. The front entry door is the first thing visitors are going to be closely examining. It can say a lot about your house. In many ways, the front door is the key point of the house. So what should you use for your front door? Before you start worrying about aesthetics and decoration, it’s important to decide on a material. Because the front door tends to be exposed to all the elements in all seasons, you need to take into account what material would be best suited for the area you live in. For example, if you’re in a very warm and humid climate, having a solid wood door may not be the best choice. Rain and sunlight will warp even the toughest woods in a matter of years. 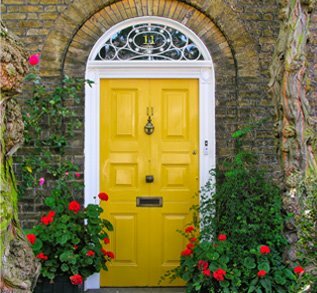 While it may not seem like a big deal to replace your front door every few years, it’s far better to get a reliable door that will last for decades. There are three main materials used in modern front doors: wood, steel and fiberglass. Many times these materials are combined. It’s fairly common to see a door with a steel core and wood on the outside. You’ll also see plenty of doors with foam insulation in their center. This does as much better job keeping your house at the correct temperature than a door made completely from solid material would. You also need to keep things such a locksets, framing, weather-stripping and hinges in mind. If you’re planning on completely redoing your front door, or you’re starting from scratch, you might consider investing in what’s called an “entry system”. This is basically an all-in-one for your front door; it comes with a door that’s pre-hung in a frame, pre-installed hinges and lockets, weather-stripping and sometimes sidelites. Everything’s designed to fit together perfectly, so you won’t have any of the uncertainties you would when putting your entry door up from scratch. This also takes away from the customization of the door, however, so it’s up to you which way you’d rather go. Once you’ve decided on what material(s) you want for your door, you just have to pick out something you like and you’re home free. You should now have an excellent front door that will give a solid statement about your house as well as providing a sturdy, durable seal for your front door for many years to come.